Traumatic events can hold great sway over our lives. They can trigger reactions that are often times not healthy for us. I was at the Museum of Tolerance in Los Angeles and saw someone speak who was born in Brussels in 1943. For the first two years of his life, he and another boy were raised by their parents in a 200 square foot basement being hidden away by a woman to avoid their capture by the Nazis. Interestingly, she was married to an S.S. officer who was gone most of the time but when he returned once a month the four adults and two babies would be moved even more below ground. The speaker had ricketts after the war because he got virtually no vitamin D because he was rarely exposed to the sun. He also had a curvature of the spine due to how little movement he got and how he was typically positioned. He suffers from it to this day. The speaker ended up as a psychologist and has been married for a very long time and has kids and grandchildren. All things considered, he is very well adjusted despite what happened to him and having felt like an outcast as a Jewish kid in a Catholic school in Belgium and then moving to New York and then Los Angeles. He did say that when he is in Europe and he hears sirens he is often stopped cold in his tracks as it triggers subconscious memories of when he was in hiding. The other child who was hidden and born at the same time has been permanently scarred. Despite being a very intelligent MIT scientist, he has been married three times, has no children, and finds the need to go back to Belgium each year to visit the place he was hidden. His dad had terrible anger issues and took his wrath out on him by beating him. This individual is very unhappy, alone, and unable to integrate what happened to him in a healthy way so that he could move on with his life in a more joyful way. In many ways, he has to keep living the trauma. “… the trauma is either a single, definite, violent impact, or a complex of ideas and emotions which may be likened to a psychic wound. Everything that touches this complex, however slightly, excites a vehement reaction, a regular emotional explosion. Hence one could easily represent the trauma as a complex with a high emotional charge, and because this enormously effective charge seems at first sight to be the pathological cause of the disturbance, one can accordingly postulate a therapy whose aim is the complete release of this charge. Jung is essentially saying that traumatic events can leave enormous psychological/electrical imprints that when triggered, can lead to responses that can be quite disproportionate to the event itself because the wound is so raw and deep. The only way to truly heal is to integrate the trauma into the rest of the psyche by bringing it out of the shadows so that it does not have as much hold over an individual. It needs to be acknowledged, recognized, addressed and dealt with. It’s almost like a neglected person who will usually not stay neglected forever and will eventually make his presence felt often times in what are very destructive and negative ways. Joseph Campbell said something to the effect that the disregarded god is the most dangerous one. We are an agglomeration of so many different forms of psychic energy, positive and negative, and they all play a role in shaping who we are and how we experience the world and the decisions we make. The negative ones must be attended to probably more so than the positive ones so they don’t take hold of us. 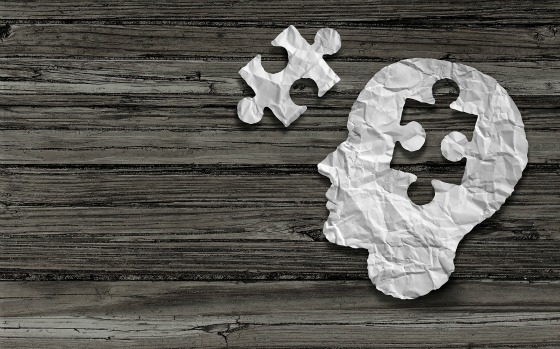 The impact of trauma isn’t just limited to the sphere of everyday life. They can influence the decisions of investors as well if they have experienced traumatic financial events. 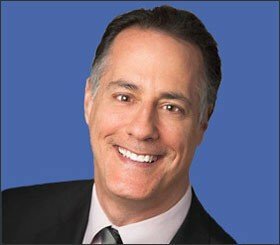 We’ve heard about the Depression Generation that was always worried about losing everything they had, not trusting banks and financial markets, and loathe to take on debt. They were understandably scarred by what they experienced and witnessed during those incredibly challenging times. People who lived through the inflation of the 1970s and early 1980s and had to contend with interest rates close to 20% are incredibly fearful of this happening again and for this reason, have terrible difficulty borrowing money via loans other than at fixed rates. Variable rate loans trigger very negative visceral reactions. Interestingly, my trauma is the opposite. We were caught with fixed-rate loans at high-interest rates (that we thought were low when the loans were originated) and couldn’t refinance them or sell the properties when rates dropped substantially because of huge pre-payment penalties. Thus, I have a very negative, visceral reaction to using fixed rate loans. I feel like I’m a prisoner that has lost control over my destiny and freedom to the lender because these loans are very costly to exit from early. Variable rate loans, on the other hand, are my nirvana, where I feel so serene and calm knowing that we can generate substantially higher cash flows in the early years versus fixed-rate loans and can exit the investment with minimal cost if we think this is the right thing to do. I do what I can to be open to having people challenge me with regard to my love affair with variable rate loans because, as it’s been said, “love is blind.” I owe it to our investors to make sure that my trauma is not ruling my decision making versus having it been integrated into my psyche so that my choices are being made in a much more healthy manner. It took us approximately 17 years to buy our first apartment community in Houston after getting back into the business in 1989. Our biases against Houston were so powerful that we essentially redlined the entire area. As it’s been said, there’s never a prophet in your own city. In other words, people can be too close to the situation and it often times takes outsiders to see the opportunities or perils that the locals might be blind to. 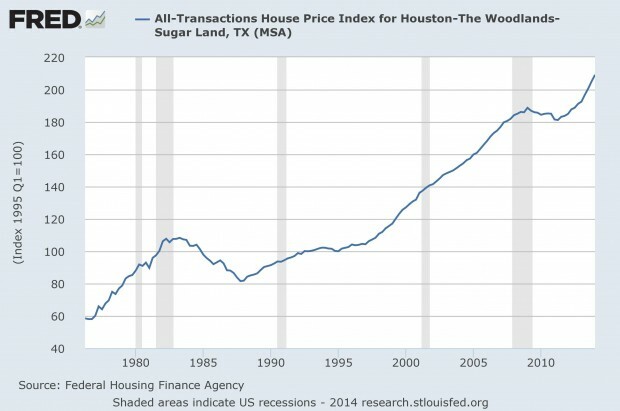 Fortunately, fresh and persuasive thinking emerged and we decided Houston was a place we needed to be investing. The values were compelling and the prospect for growth strong. Today we own 22 communities, 6,647 units. We went after it very aggressively once we recognized the opportunity and committed to it. We’re glad we did. 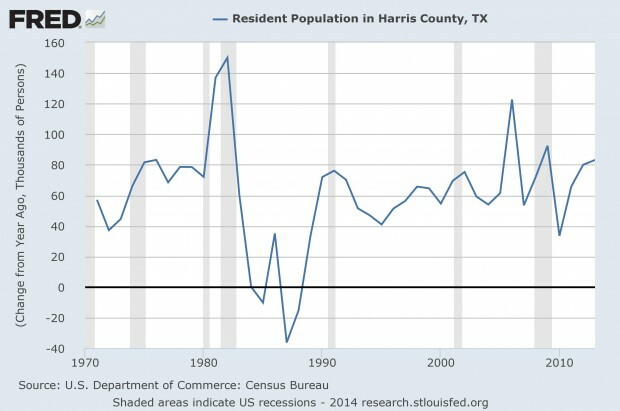 Although we didn’t start investing until 2006, Harris County, and the entire metropolitan area has grown consistently since 1990 as the above chart shows. The economy has clearly benefited from significantly greater energy investment not only in Texas due to the advent of fracking, but in other parts of the United States as well as around the world. Houston is the Silicon Valley of energy. As a result, its technical and management talent are needed around the globe. The need for energy workers in Houston has led to more immigration which has led to more jobs to support the growing population. From the table above one can see how cash flow and capital expenditures have exploded between 2009 and 2013. 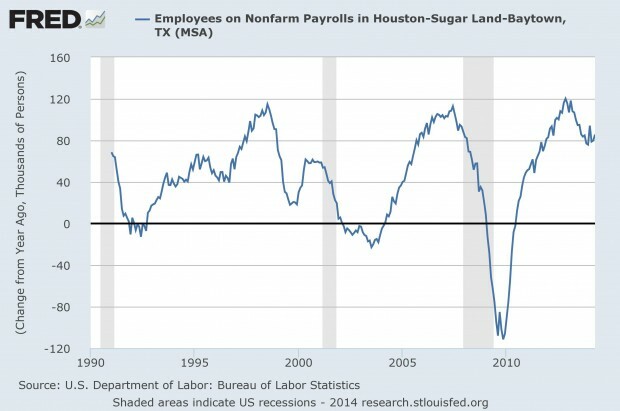 From a Houston economy perspective, capital spending is an important metric because that translates more into jobs and tangentially housing demand. It’s grown by $65 billion since 2009. Operating cash flow has only grown by $53 billion with the shortfall being made up by borrowing. In fact, borrowing has grown far faster than the excess of capital spending over operating cash flow as it has risen by $42 billion. The Majors are responsible for approximately $29 billion despite capital spending being less than operating cash flow. I believe much of the excess borrowing has been to support dividend payments and stock repurchases. 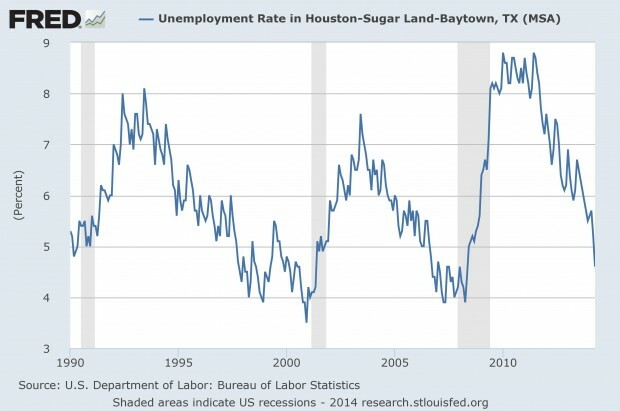 The following chart shows how the Houston economy has produced some very solid job growth which in turn has led to lower unemployment and a strong demand for housing and higher home prices as the two additional graph show. The Obama administration allowed for some very limited exports of oil and the opening up of the Mexican petroleum industry to foreign firms, Houston is very well positioned for continued growth. It has one of the best medical centers in the world, a top port, and a vibrant energy infrastructure. We are delighted that we were able to integrate our traumas from the past related to Houston in a healthy way so that it did not eventually get in the way of us making what we believe will turn out to be very wise investments.